DAMASCUS: I was fast asleep when my cell phone rang at 1am in my clean but basic hotel in Damascus. “Hello,” I said, not giving my name. The caller spoke in Arabic. Again, I said hello and this time he replied in fluent English, “Oh! I’m so sorry”, and put the phone down. I looked at the number. It was that of the pro-democracy activist I had met the previous day, but it wasn’t the activist who had called. The activist had a deeper voice. The next day I bought a new SIM card for my phone. When I met the activist for lunch, he was surprised. He had thought his line was secure. Hours later the new SIM became inoperable. Anyone I called was “out of area”. The manager of a cell phone shop said I could only pursue it with the company that sold the SIM. I went back to broadcasting reports on the old SIM. The next afternoon that card became inoperable. Two SIMs blocked in two days… the little grey men were closing in. I decided to leave. I saw myself in a race to get to the border before the officials there heard from the authority that had blocked my SIMs. I called a Palestinian friend in London to ask him to argue my case if the passport officials created problems. Fortunately the crossing went smoothly, and within minutes I was on safe territory. I was one of several journalists who had come to Syria, concealing our real professions, to see whether President Bashar Assad could surf the wave of demand for democracy or be drowned by it, as were Zine Ben Ali of Tunisia and Hosni Mubarak of Egypt. Will ‘The Arab Spring’ come to Syria in the same way as Tunisia and Egypt? The first thing that struck me was the difference between the news reports and the reality on the ground. The reports gave the impression that Syria was on fire… riots in seven or eight towns, troops backed by tanks conducting house-to-house searches. But in Damascus and Aleppo, the country’s biggest cities, millions of people were going to work, shopping, and walking in the park. Protests were rare and, if they occurred at all, they took place after Friday prayers and were quickly dispersed. Assad’s government was paying a price for banning foreign journalists. The world was not hearing that for most of the country it was business as usual. Instead, the world was hearing what Assad’s opponents wanted it hear. On Monday (9th May 2011) evening, a group of young people sat on the paving stones in Damascus’ Arnous Square, chanting pro-democracy slogans and singing patriotic songs. Plain clothes security officials dispersed the protesters and arrested some. The next day BBC World broadcast a video of the protest that had been posted on the Internet. The BBC reporter in Beirut said “hundreds” had taken part in the protest. The New York Times reported from Beirut there had been 250 protesters and 32 were detained. Its source was the Syrian rights group, Insan. As soon as I heard the BBC report, I called a rights group worker. He said he had seen the demonstration. There were only about 30 protesters, and no more than six were arrested. The question is not whose report was the most accurate. My contact could have duped me. The point is the banning of foreign media has left journalists at the mercy of activists and rights groups, people with an agenda and whose information is often second-hand. How many protesters were detained? That figure should have come from the police, but no foreign reporter was going to get an answer from them. When I first went to Syria in 1987, my traveller’s cheques were stolen. It took an inordinate amount of time to get a declaration from the Damascus police station. The commander didn’t know what a traveller’s cheque was. The translator told me the commander feared I would use the declaration not for a refund but to “get Syrians into trouble”. Syria has come a long way since then. Its people are sophisticated. Men and women dress elegantly, not just the rich, but middle-class people as well. Young people are IT savvy and many speak good English. Satellite dishes are on the roofs of houses in even the poorest villages. When the uprising began in mid-March, provoked by a heavy-handed response to teenagers scrawling anti-government graffiti in the southern city of Deraa, Middle East watchers hoped that Syria would follow the trend set by Tunisia and Egypt. However, a Syrian revolution is a long way off. The demonstrations are big stuff for a totalitarian state where opposition is outlawed. But they are not big in terms of a population of 23 million. The largest protests have drawn up to 10,000 people. The dissidents who organise by cell phone and Facebook have not managed to bring on to the streets of Damascus and Aleppo the hundreds of thousands of people like in Cairo. But that could change if the security forces blunder. A diplomat in Damascus said the tipping point could be an atrocity that so inflamed public opinion that people poured on to the street in protest. Assad seems to know this. His aides say he has ordered the troops to restrict their fire. And the facts support this. The death toll on Fridays, the day for demonstrations, has fallen substantially: April 22 — more than 100 killed; April 29 — more than 60; May 6 — about 30; May 13 – nine dead. Although this last Friday (May 20), the toll rose to 44 dead, according to the National Organisation for Human Rights in Syria, it was still lower than the April figures. Reporting in Syria was frustrating. I couldn’t interview strangers for fear of informers. 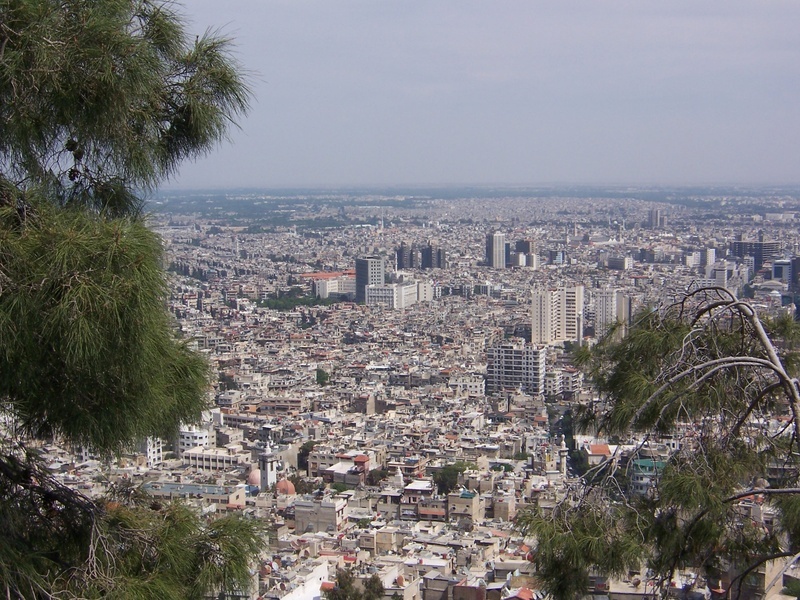 When the army moved into two suburbs on the outskirts of Damascus, I couldn’t go there. My activist friend warned me that as there was no museum or monument in that area, I was likely to be arrested at the first checkpoint. I was filing live reports, under a pseudonym, to French and Canadian television and radio stations. In my hotel room, I would turn on the TV to mask the sound of my voice. Often I tried to find an isolated bench in a park. But the man brewing tea on a camping stove would come over and offer me a cup. Students would want to practise their English. Once I was sure the man who had sat down on the bench was an informer trying to figure out what the only foreigner was doing in the park at 8 o’clock at night. Fortunately he left before CBC TV called. Will democracy prevail in Syria? People say that Syrians are holding back from coming out against the regime for three reasons. They are scared of the security forces – who have killed 800-900 people in eight weeks and detained about 8,000, according to activists and rights groups. They are scared of sectarian divisions (Alawite versus Sunni, Christian versus Muslim, Arab versus Kurd) engulfing the country mirroring the horrors seen in neighbouring Lebanon and Iraq. And many middle-class people have done well from Bashar Assad’s opening the country to foreign investment and trade since he succeeded his father in 2000. They fear losing their prosperity. All these reasons are sound, but the demand for democracy is there. The receptionists in my Aleppo hotel watched the news on the satellite channel Al-Jazeera, which the state has accused of sedition. In my favourite fruit-juice shop, the TV was routinely turned to Al-Arabiya. One night it showed a column of tanks waiting to roll into Deraa. Another night, the TV was on BBC Arabic. The anchorman was questioning his guest about the massacre in Hama in 1982, when President Hafez Assad put down an Islamic revolt at the cost of at least 10,000 lives. The event is a taboo in Syria. Officially it didn’t happen, but there in the juice shop in down town Damascus we were hearing all about it. I had laptop problems while in Syria and consequently spent a lot of time in Internet cafes. State filters were so heavy that I couldn’t even open a Yahoo story on the royal wedding. In some cafes the manager would just smile and say I had to accept the “access denied” window. But in other cafes the staff were contemptuous of these barriers. They would grab my mouse, delve into the deeper reaches of the hard drive, and open the story within a minute. One time I heard protest chants coming from the cafe’s control computer. The manager appeared to be watching a demonstration on YouTube. This is the government’s weakness. It can crush demonstrations. It can throw dissidents in jail. But it cannot change the way people are thinking. Syrians are voting for liberty with their computer mouse and TV remote. Looking ahead, I think what we may see is not a revolution, but a shift in the balance of power. The government is likely to prevail, but it will have been weakened. The opposition will have a profile higher than ever before, but it won’t take power. It may require a second uprising for Syrians to gain the democracy their brave protesters deserve. While in Syria Simon was covered through the GRN Newsgathering Assignment Insurance and technically supported by Avaaz. Thanks are due to everybody at CBC, France 24 and elsewhere who worked with Simon while he was in the country.